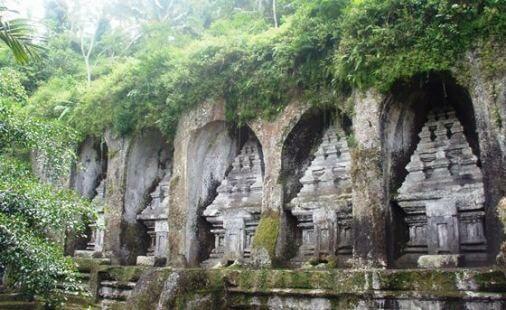 Gunung Kawi Temple Bali is royal monuments that spread across either side of the Pakerisan River. 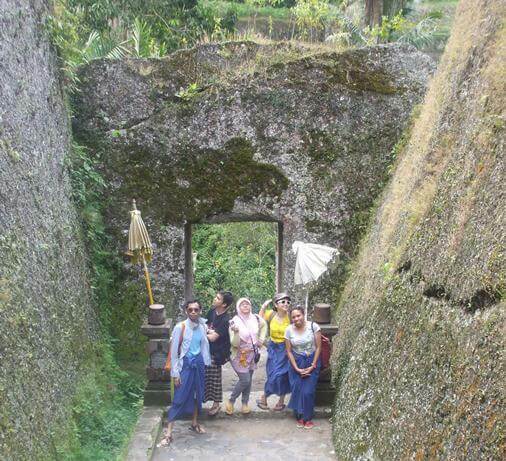 This rock-cut architecture offers the visitor a majesty and richness history of Ancient Balinese Kingdom. You have to walk down through stone steps to reach the temple. Alongside the steps visitors will be treated by a magnificence view of rice terraces and Pakerisan River. The temple also offers a romantic atmosphere for outdoor pre wedding photoshoot. Let's take a closer look to the amazing of rock-cut architecture temple in Bali! 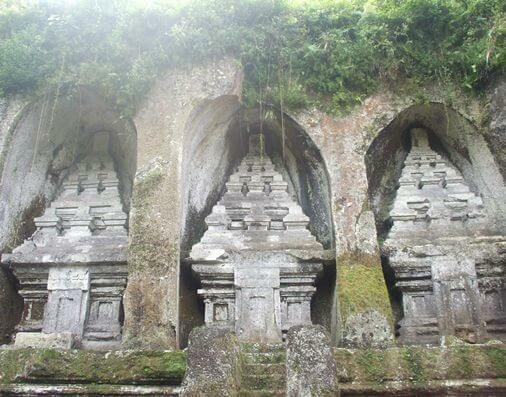 Gunung Kawi rock-cut architecture temple is spread across either side of the Pakerisan river. This ancient rock-cut architecture comprises 10 shrines that are carved into 7 meter high (23 ft) sheltered niches. This rock-cut monument was start from the reign of King Udayana. Then being developed by King Marakata continues until the reign of King Anak Wungsu. On the east side of the Pekerisan river, there are five shrines that are dedicated (according to one theory) to King Udayana, Mahendradatta, Airlanga, Marakata, and Anak Wungsu. While the rock-cut shrines on the west side are dedicated (according to the same theory) to the king's minor queens or concubines. This unique architecture shrines are situated in the District of Tampaksiring, Gianyar Regency, Bali. Visitor can access this place directly from Ngurah Rai International Airport, about 55 Kilometers (1 hour 40 minutes) through Jalan Prof. Ida Bagus Mantra. The temple is close to another tourist spot such as Ubud Palace about 16 Kilometers (35 minutes), Ubud Monkey Forest, Yeh Pulu, Goa Garba, Goa Gajah, and Tirta Empul. In the Inscription of Tengkulak on 945 Caka, issued by King Marakata, Gunung Kawi is mentioned as royal monuments located in Pekerisan River. King Marakata is the son of King Udayana Warmadewan and his Queen Mahendradatta (Gunapriyadharmapatni) including Airlangga and Anak Wungsu. Airlangga, who replaced the overthrown emperor of Java, Dharmawangsa, ruled in both Java and Bali (his homeland). Marakata, the younger son, later become king of Bali after the death of Udayana. The royal monuments are founded at the reign of King Udayana Warmadewa about 989 AD and developed by King Marakata on his governance on 1023 AD which later called Katyangan Amarawati. The development of Katyangan Amarawati continued at the era of King Anak Wungsu, who ascend to Balinese throne after the death of Marakata. King Anak Wungsu lead between the years of 1049-1077 AD. The monuments or Katyangan Amarawati are carved on a solid rock hill. The shaped is similar to candi that mostly found all over Central and East Java. If we see from the history and the intent of the monuments construction, it's not categorized to worshiping the Hindu God but more related to commemoration or reverence for the king and royal family. On the above of temple at the Eastside River, there is Kediri Words sounding "Haji Lumahing Jalu". "Haji" mean a King. 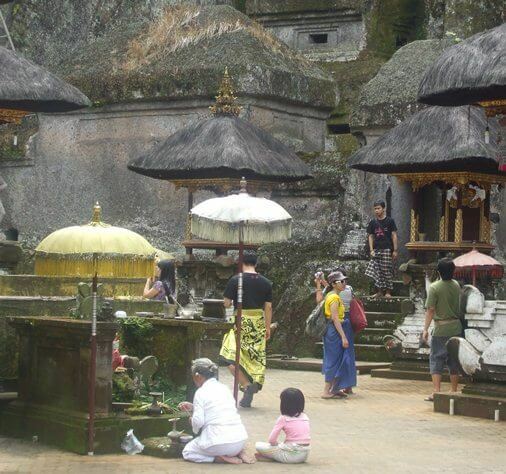 "Lumah" mean Temple or Sihda Dewata (return to the God Realm or Nirvana). "Ing Jalu" mean in Pekerisan River ("jalu" mean keris). 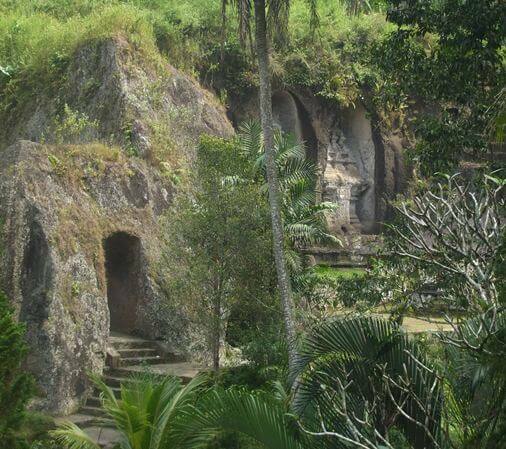 Gunung Kawi also offers a romantic atmosphere for visitors, especially couples who are getting married. The rock-cut architecture can be an interesting theme for outdoor pre wedding photoshoot. This shrines are a trace of civilization that rich in cultural values, unique, elegant, beautiful and exotic. The pre wedding photoshoot here can take the concept of casual, simple, modern, relaxing and Bali custom. The couples usually cooperate with the photographer to do a pre wedding photoshoot here. With careful preparation and excellent condition both physically and mood, couples can capture the best moment with the backdrop of rock-cut shrines for their special day. Situated in Tampaksiring area, this place is influenced by Very Wet Region Climate or A type climate (based on Schmidt-Ferguson climate classification maps). Very Wet Region climate in Gianyar Regency has humid season which begin from November continues until August (10 months). Dry month in September and Oktober. Due to this climate type has long rainy season so there is a water source throughout the year. The soil around this area is very fertile because of the volcanic soils derived from volcanic group Buyan-Bratan-Batur. The abundance water source combine with fertile volcanic soil make this area most suitable for rice fields. The flows of Pakerisan River irrigating the subak channel till the bottom of valley. Farmer are very happy to got the water flow into their fields. This rock-cut temple is part of the subak system in the Pekerisan Watershed. The Subak Landscape Of The Pekerisan Watershed has been designated by UNESCO World Heritage Center (in Cultural Category) as a Cultural Landscape of Bali. The Pekerisan Watershed is part of Subak System in Bali as a manifestation of the Tri Hita Karana Philosophy. In total Bali has about 1,200 water collectives and between 50 and 400 farmers manage the water supply from one source of water. The property consists of five sites: The Supreme Water Temple Of Pura Ulun Danu Batur, Lake Batur, The Subak Landscape Of The Pakerisan Watershed , The Subak Landscape Of Catur Angga Batukaru, and The Royal Water Temple Of Pura Taman Ayun. Feel the romantic nuance and tranquility from the richness culture of Ancient Balinese Kingdom fused with exotic views of rice terrace that cleaved by Pakerisan River. 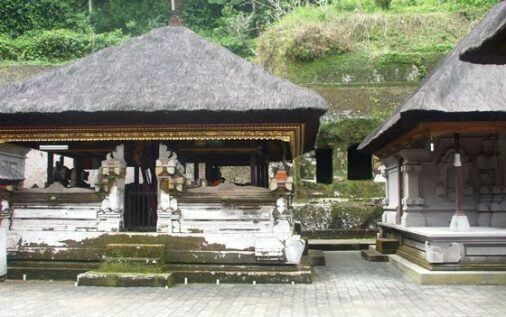 Take your time to travel to Gunung Kawi Temple Bali, hopefully helpful and thank you!